I’ve been blessed enough to be able to attend many yoga festivals this year, and I always leave each one feeling more alive than when I entered. 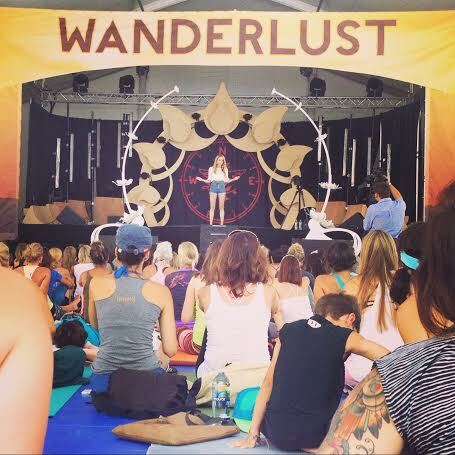 AMAZING Yoga Teachers –The caliber of teachers at this festival was insane. Tiffany Cruikshank, Jill Knouse, Stephanie Snyder, Noah Maze, Gurmukh, Shiva Rea, Seane Corn, Kerri Kelly, Rod Stryker….need I say more? Squaw Valley, CA – The festival is located in Squaw Valley just outside of Lake Tahoe. Imagine Lake Tahoe this time of year. Now imagine Lake Tahoe this time of year while meditating in the forest and listening to a live cellist. YES. AMAZING. The landscape and energy of the place was just surreal. Opening Day Spectacular – I was really impressed. DJ Drez spinning beats to a performance by acroyogis and slackliners. It was my first time seeing DJ Drez perform and my first time seeing slackline yoga. If you don’t know what slackline yoga is; google it. You will be amazed by the creativity and physicality of these human beings we call yogis. Kevin Paris – He played live music for my first and last class. He inspired me so much that I emailed him when I got home. I used to sing….a lot. Singing was my life for many years but I lost that part of me when I chose a different path (corporate robot life). Now that I’m being true to myself again, I’ve been feeling a faint pull in me to start singing and creating mantra music. That pull was so strong when I heard him play during class. Thank you Kevin for inspiring me! Gabrielle Bernstein – I was so excited to see this girl speak and she did not disappoint. I feel like a little schoolgirl when I say I want to be like her, but seriously, I WANT TO BE JUST LIKE HER. She is doing a wonderful and quite masterful job of spreading the teachings of Yogi Bhajan and Kundalini Yoga with a modern twist. And her voice is so much sultrier than I imagined! Truly amazing. Lululemon D’OM – When I walked into their dome, I felt like I was at the Do Lab stage at Coachella. What a strange feeling…. Meet the Producers – I probably would’ve put this in the memorable category but I came super late and only caught the last 15 minutes. Lots of talk about the logistics behind planning a massive festival of this scale and what’s in store for the future of Wanderlust. Shiva Rea and Rod Stryker – To be completely honest, I wasn’t a fan of their class. They taught a class together and while I think I like both of them individually, I didn’t resonate with them co-teaching. I was also EXHAUSTED at this point of the day so that may have something to do with it. Happy Hour – I don’t think Tito belongs in the vodka industry. And I definitely don’t think Tito’s handmade vodka should be mixed with organic kombucha — sorry! Hail Storm? – Did you know that it hails in Squaw Valley during the summer time? Yeah, me neither. And when it hails, it hails in the middle of the day with ice balls the size of yoni eggs. Yoga for the Upperclass – The festival runs through a shopping center filled with restaurants, shops, and hotels. Although they do have some camping options available far away from the actual festival grounds. It’s a different vibe from the desert dunes of Bhakti Fest. Neither one is better than the other, it just depends on what you’re into (I prefer to be grimey and dirty after these things). Mark Sexton Band – They played a 3 hour set from 5-8pm on Friday evening. This is prime yogi rest time when we’ve sweated every ounce of sweat from pores and stretched our bodies to its maximum. I was looking forward to doing nothing but listening to good music. Unfortunately….their music sucked. Despite the not so memorable moments, I would still rate my experience as a 10/10. Please consider going to Wanderlust next year! You won’t regret it.